Carlos Sr. and Jr. are the perfect hosts. They welcomed us with sparkling wine and Quesada, a local treat. Next, they helped us find an open supermarket and took us to buy groceries. That set the tone for our perfect week-long stay. Our first evening, while dining in the large back patio, Carlos Sr. returned with a group of musicians and we were serenaded (tono). How delightful and memorable! One of our adolescents required medical attention and Carlos Jr. helped us find it. They were responsive but never intrusive. The house is as pictured, large, clean and well furnished. It sits on a former fig farm and is surrounded by working farms. At night we heard cows mooing and in the morning roosters! It's surrounded by evergreens to provide privacy. It's 10 minutes to Santander and just a few more minutes drive to beautiful beaches of Some and Sardinero. The zoo is about half an hour away. Everything about this house and our stay was perfect for our family of 8! We were sad to leave. We were a group of 8 friends who spent a 3 days vacation in Cantabria. This big house is located about 7 Km from the centre of Santader, in a quiet and elegant district . This location was very appreciated because ensured us peace and silence avoiding the noise and the confusion typical of a big town. In the same time, the house is strategically situated few meters far from A67, the highway which allows to reach very easily wonderful places such as Santillana del Mar, Comillas , etc, as well as Santander. The house is convenient and well furnished. We appreciated in particular the beds, very comfortable. Both Carlos senior and Carlos junior were very kind and willing to satisfy all our needs. Magnifico fin de semana que pasamos en este chalet. Buena presencia, limpieza y todo muy comodo para pasar unos días en familia o con amigos. Buen servicio por parte del propietario dándonos todas las facilidades posibles. Totalmente recomendable. The city of Santander is 5 minutes, is directly accessible by the highway, parked next to the football field and on foot visiting the Sardinero and the beautiful bay. Cabarceno Natural Park (15 km). Cabarceno Park is worth visiting, has many kinds of wild animals, gorillas, elephants, giraffes, bears, mostly in semi-freedom. Las Cuevas del Soplao (40 km). Fantastic caves open to the public recently. The Picos de Europa (80 km). In less than an hour you can reach the heart of the Picos de Europa, both the Cantabrian and Asturian part. - Comillas and Santillana del Mar 20 minutes by motorway. - San Vicente de la Barquera 30 minutes by motorway. - Caves Soplao 40 minutes by motorway. - Guggenheim Museum Bilbao 1 hour by road. - The Picos de Europa to 1 hour. Within 10 minutes of the 6 most beautiful beaches Cantabria. 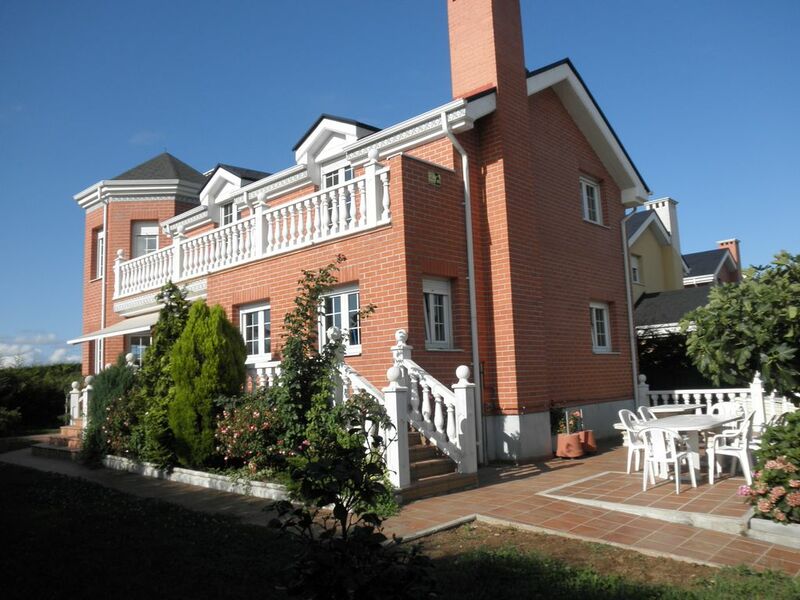 Large garden with 3 furnished terraces and barbecue. 2 free 150 m from the house and playground at 80 m pools. 4 TV and DVD with 300 movies. Very safe housing for children and very close to everything, supermarkets, cinemas, beaches, city, etc.